German merchant; born in Rausnitz, Moravia; died there Dec. 17, 1839. 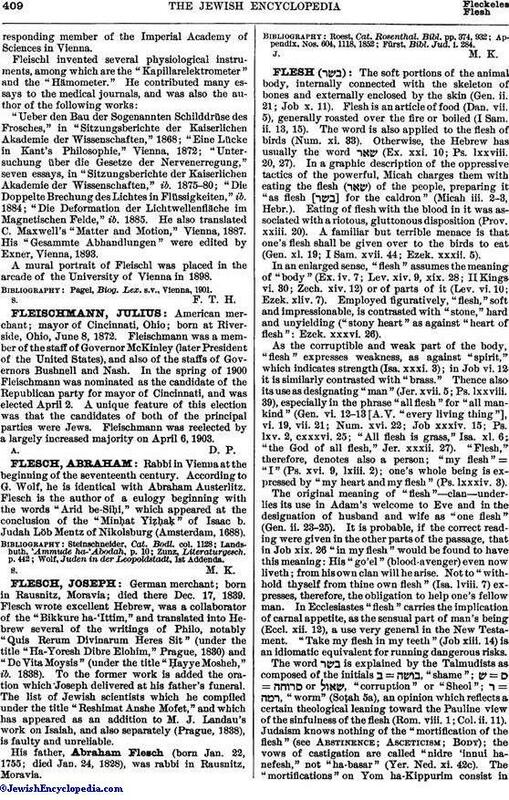 Flesch wrote excellent Hebrew, was a collaborator of the "Bikkure ha-'Ittim," and translated into Hebrew several of the writings of Philo, notably "Quis Rerum Divinarum Heres Sit" (under the title "Ha-Yoresh Dibre Elohim," Prague, 1830) and "De Vita Moysis" (under the title "Ḥayye Mosheh," ib. 1838). To the former work is added the oration which Joseph delivered at his father's funeral. The list of Jewish scientists which he compiled under the title "Reshimat Anshe Mofet," and which has appeared as an addition to M. J. Landau's work on Isaiah, and also separately (Prague, 1838), is faulty and unreliable. His father, Abraham Flesch (born Jan. 22, 1755; died. Jan. 24, 1828), was rabbi in Rausnitz, Moravia. Fürst, Bibl. Jud. i. 284.